"It was a very nice experience to stay in this hotel." "Little inspects were found and the staff are very nice." "Love the private pool and quietness." "Rooms are spacious and clean." 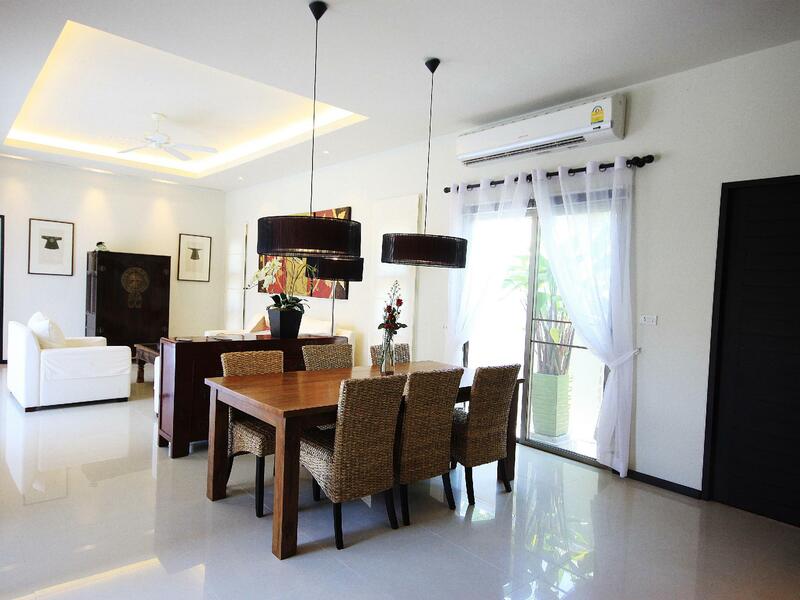 A stay at this 4-star villa in Bang Thao, Phuket will make your trip unforgettable and enjoyable. 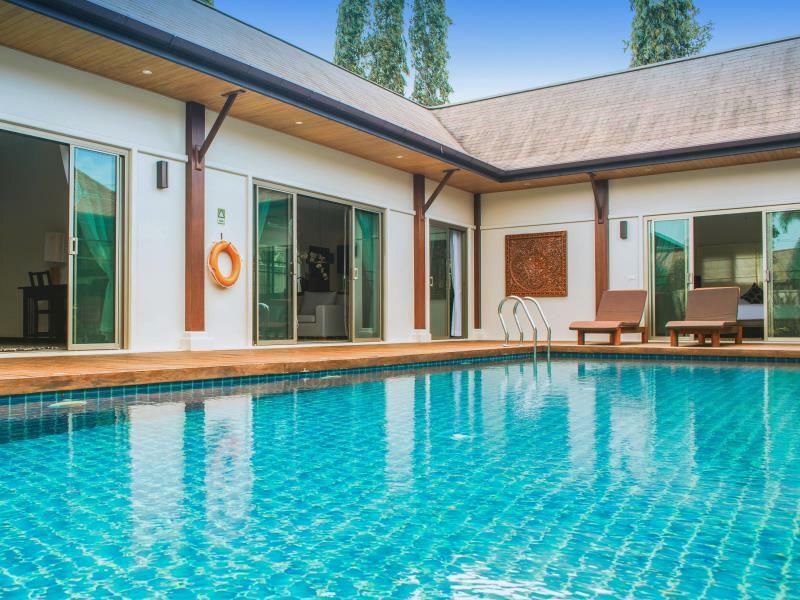 The villa is close to places of interest such as Banyan Tree Golf Club, Laguna Phuket Golf Club, Wat Thep Krasattri, Canal Village Shopping Centre, and Milan Tailor Ltd. To make your vacation truly relaxing, you can take a short break from your other activities and pamper yourself for a few hours with a massage. With guided tours available, this villa is the perfect place to stay to learn about the area and see everything you can while you're here. It has BBQ facilities and room service, so there is a range of dining and snacking choices for guests to enjoy. The villa offers a range of facilities for guests to make use of throughout their stay, such as a garden and an outdoor swimming pool. It has various convenient features, such as an infirmary, a selection of shops, a smoking area, as well as safety deposit boxes. This villa has air conditioning, a hair dryer, satellite or cable channels, and an in-room safe box. It also has a seating area, bathrobes, a bathtub, ironing facilities, and other amenities. There's free Wi-Fi available in all rooms, as well as Wi-Fi in common areas, so visitors won't have to worry about purchasing a local sim card. From a concierge to a babysitting service, this villa has various useful services to ensure that you get the most out of your stay in Bang Thao. With an around-the-clock front desk, it ensures that there is always a staff member on call to answer any questions at any time. It is pet-friendly, so you don't have to worry about finding someone to look after your pet while you're away from home. It has an assortment of transport options that include airport transfers, taxi services, bicycle rentals, car rentals, and shuttle services. Phuket Bus Terminal 2 is 14.6 km away. The nearest airports are Phuket International Airport (HKT) and Krabi International Airport (KBV), which are situated 10.2 km and 74.5 km away. "Great breakfast with friendly staffs too"
For bookings 1-3 nights, a security deposit of THB 3,000 is required. For bookings 4-7 nights, a security deposit of THB 5,000 is required. For bookings 8-14 nights, a security deposit of THB 10,000 is required. For bookings 15-30 nights, a security deposit of THB 20,000 is required. The property provides shuttle service to nearby beach for limited time. Kindly contact the property for more details. The property provides shuttle service to nearby beach. Kindly contact the property for more details. We are 6 person with a 8-month baby stayed in the hotel for 4 nights. It was a very nice experience to stay in this hotel. Rooms are spacious and clean. Little inspects were found and the staff are very nice. We booked for the massage provided from the hotel and the price is reasonable. The villa is very clean and very comfortable. Our stay in Oriental Villa make us feel like home. Abit too far from town, but with own vehicle makes it alot convenient. Staff are friendly and attentive and this is not the first time we stayed in Two Villa. The private pool is quite big comparing to alot other villa. It just have all amenities we need inside the villa. The maid will come in and cook breakfast in the morning and the preparation of breakfast is wonderful. We will definitely go back to Two Villa Holiday on our next stay. Amazing Villa! Value for money. A little far from all the main attractions but most tour services provide transport. We rented a car to move around, and they have parking so it was okay. Good for peace and tranquility. Staff are friendly and very prompt when it comes to serving breakfast. the villa was very hard to find and even though we arrived in two seperate vans both local drivers got lost along the way. the villa's interior is very nice and clean, it had a kitchen pantry area that is good for cooking. we booked a 3 bedroom villa, 2 big bedrooms were in the villa itself but the other bedroom was across from the pool, so its like another attic by itself so some families may not want to be seperated that way and may appear eerie to some. all bedrooms come with attached bathrooms. pool is ample for 6. villa management office people are very friendly and helpful and they provide each villa with a nokia mobile phone which they contact you with. housekeeping staff could smile more, they weren't like the typical thai people who are friendly and smiley. all in all, nice and cosy, good for a getaway if you want to forget about the rest of the world and just stay in. i don't recommend this place for people who want to go out to patong beach or paint the town red as it is just too far to head out. I stayed in the Villa Tara 9 with friends. That villa has a big private swimming pool with pretty good free wifi connection. Cooking or BBQ in the villa is a very good activity when you stay in the villa. Suggest to hire a car if you planned to stay in the villa. Travelling with 10 ppl. One of my fav villa. Love the private pool and quietness. In the other villa that my friends were staying, a snake was outside his room and he had to wait for it to go away before able to go to the room. the room was an isolated corner, away from the main living area. Courteous and helpful staff, wonderful in-villa breakfast preparation and the comforting layout of the villa. 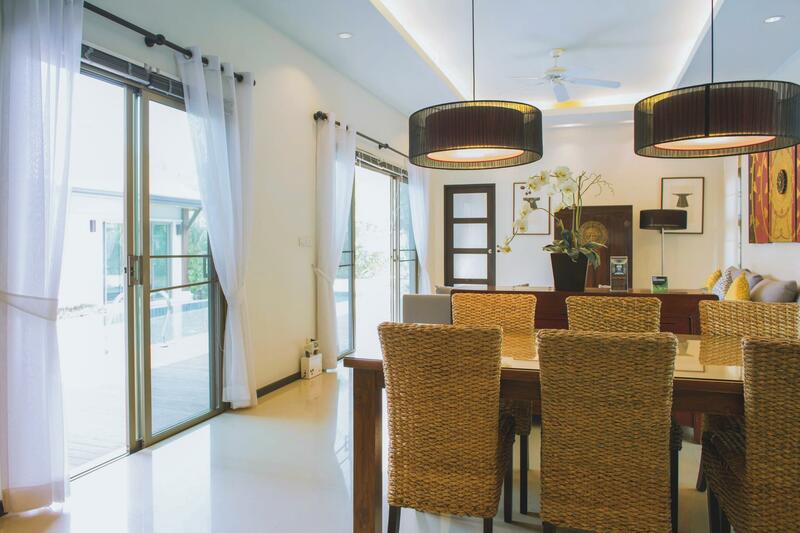 Other than the location of the villas which was very challenging to locate especially for a first-timer in Phuket, it was compensated with the beautiful and comforting layout of the 3-bedroom villa added with the courteous and helpful services of the staff. Overall is excellent! Good villa and suitable for traveller for family with child or a group of people. Just the villa we stay, one of the toilet water system can't work well. Cannot flush the toilet bowl and the water being flood over. It take some time to wait the water reduce down. Overall stay was good. Beds were clean. There's a private pool for us to swim in anytime we want. Every morning the "chef" will come to your room and cook the breakfast for you. Better to rent a car to move around. We will definitely go back to Two Villa Holiday on our next stay. Private pool villa, large and spacious interiors and customized breakfasts. My stay at Two Villas Layan was very good. Being close to the beaches was a major plus point but best of all is the private pool right outside my bedroom. Welcoming in the morning and also after returning from a full day out. Though the hotel is not facing the beach.. However, its beautiful and cosy. All of us are very satify with the Villa. Kid enjoys very much... they swim day and night .. and not willing to go out. Location is remote but if you rent a car... Its fantastic... Cheap price and good quality. i come here together with my parents and god parents total six people, we rent a villa there and the price is very reasonable. Staff is very friendly and the room condition is very good, especially the pool! you can swim in there all day! you can even buy staff back to the hotel and cook your self. every morning the staff will come to your room and cook the breakfast for you. everything about the hotel is perfect except the location, its not near the beach and you need a car to go out. But stay in the hotel is quite fun ! We had a fabulous time here! I would come back to Phuket just to stay here again! Firstly would like to thank the staff for making our stay an enjoyable one! We stay only 1 night, that was a pity cause we would like to stay longer but have no more time. Cleanliness of rooms was of a 5-star standard, very well maintained and spacious. We stayed in a one bedroom villa with big private swimming pool. Basically this villa is 3 bedrooms however they closed 2nd & 3rd bedroom but it doesn't matter cause villa is very big and we pay on one bedroom rate which make me feel so value to spend. What a beautiful place to stay, the villa was modern and clean and the huge pool was wonderful. You have absolute privacy within your villa, beautifully manicured garden, relax pool deck area and that amazing swimming pool. The villa had a well equipped kitchen with a full sized fridge, the free Wi-Fi was great never slow or dropping out a great bonus. All the staff were friendly and helpful. Breakfast was wonderful even it was not a buffet but there was choices for us to select a la cart breakfast which housekeeper came inside villa & cooked fresh breakfast for us. There was BBQ stove available in reasonable price which we enjoyed fresh seafood BBQ, that was great to chill out beside pool with great seafood Layan beach & Bangtao beach is around 5- 10 min drive, so it was quite a hassle to go to the beach from the villa. However Free shuttle bus was available for the guests but u need to notify them in advance. Overall I would highly recommend this resort for a quiet, private getaway out of the hustle and bustle of Patong. If you are looking for nice, relaxing holiday with you love one, I would strongly suggest this resort. We plan to come back again with our family March 2013. Like everyone said, the villa is exactly as you can see in the pictures! If you want total privacy, away from Patong nigth life and crowd then this is the place to be! Big villa suitable for couple and family. Big Pool! And most importantly, its clean! You can use the facilities, such as the fridge, kitchenware and everything that's in the villa. The only cons will be, its always better to have your own transport. Can book through the reception upon check in! We rented a bike, and never regreted! Good services from the receptionist and staff! Hotel food are nice! Definitely will come back! The hotel is very beautiful and more like private home. The swimming pool make this hotel more fun. I suggest that anyone who have kids or group of friends should visit this hotel. The beach is quite far from this hotel but I think it is no problem since there are a transport of the hotel to the nearest beach. I plan to visit this hotel next time in a near future.